1953　Jinenbo Nakagawa was born in Saga. 1977　Jinenbo studied under Touya Inoue. 1982　Became independent and built his own kiln. 1985　Held his first solo exhibition at Shibuya Kurodatoen. 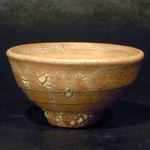 2000　Started pushing himself to reproduce Oku-gorai and Oh-ido Chawan (Old Korean type tea bowls) .